Join us on a full filled winter excursion to enjoy Alaska's official state sport, dog mushing! Meet real Iditarod racing dogs and ride real racing trails north of Anchorage. Each ride consists of 1-4 riders hooked up to a dog sled team with a local Alaskan musher as your guide. 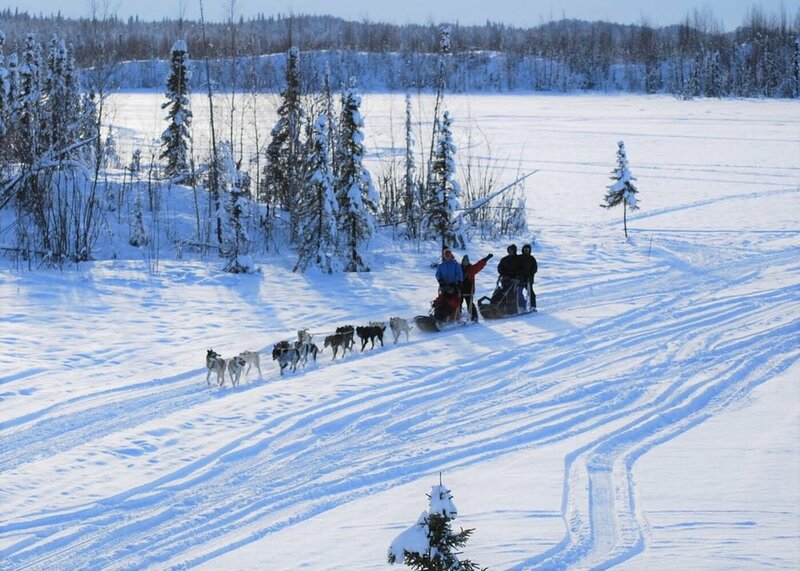 Enjoy the serenity of the Alaskan winter landscape in a way that only a dog sled ride can provide. Round trip transportation and hotel pick up included. *Note: Our kennels are located approximately 90 minutes north of Anchorage. Guests with their own mode of transportation that is suitable to travel Alaskan winter road conditions may book a self driving tour here. Sooo glad we booked this! Nik picked us up at our hotel for the hour + ride to Happy Trails Kennel; for our dog sledding tour.So glad I arranged this as the weather was snowing, visibility limited and dark. I sat back and relaxed, Nik knew the way & was an experienced 'snow driver'. I didn't have to navigate my way in the dark snowy conditions. He provided snacks in the shuttle and a delicious hot lunch after our dog sled ride. Very professional, a real treat.Thanks Nik!